Glowing with good health. Radiant with self-confidence. In recent history, the feminine has been associated with the moon, that heavenly body which does not shine its own light, but reflects the light of the sun (associated with the masculine). This is an interesting analogy of the role that women have played for the past couple thousand years… that of being the reflectors of the shining solar masculine; sometimes in their shadow, but not emitting their own light. I’m not playing the feminist card here or making judgments. I’m simply calling what I’m seeing and feeling. This does not feel to me like the feminine coming into unbalanced power-over. It feels like the masculine and feminine coming into a time of harmony and balance. Equality isn’t even really the right concept, because there are different but complementary gifts that each bring to the mix. The lovely paradox here (and I love paradoxes), is that as women step into empowerment, we must learn to embody the power of our YIN: the ability to receive; to ask for what we want; to understand our innate power to magnetize all that we desire without needing to chase, quest, and conquer. We get to learn how to recline on the velvet chaise to balance out those power meetings with our teams and hours of intense output. It doesn’t matter if it’s taking care of the house and kids, hours on the phone with clients, planted at the computer desk, or bending over a massage table. Whatever form the giving of our gifts to the world takes must be offset with rest, recreation, fun, and play. 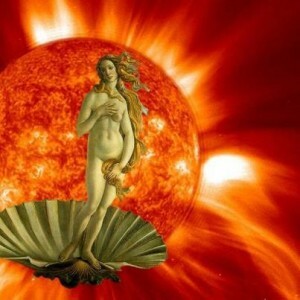 I’ve been on a parallel path with the emergence of the Solar Feminine. Her life story and mine are intertwined. What it has taken for me to learn how to recline on the velvet chaise has been no small feat… and I’m still learning. For me, and in the feminine collective, it’s been a journey of intense internal shadow excavation, leaving behind the old programs of care-taking, control-freaking, shutting up, and all manner of unhealed, compounded wounding we’ve carried through untold generations. I often feel my ancestresses cheering from beyond the veil as I ride the leading edge on the back of a tiger, slashing with my sword through old paradigms of feminine victim-hood, martyrdom, and sexual abuse and repression. The Solar Feminine is rising in the East, the direction of new beginnings, of sunrise, of Spring, of youth, of playfulness, and the color of orange. She is ready to meet the shining masculine in all his powerful glory, bringing a spirit of collaboration, compassion, and creativity. Can I hear a hallelujah? This entry was posted in Sacred Feminine, The Solar Feminine, Wholeness and tagged Amrita, empowerment, Maui, shadow, Solar Feminine, Sun, Venus, wholeness, women. Bookmark the permalink.